SodaStream is of course the parent company of the EcoStream shop in Brighton, which for more than 18 months has been the scene of lively protests by supporters of justice for Palestine. SodaStream is an Israeli-owned company whose main factory is located in Mishor Adumim, an industrial zone within the illegal Israeli colony Ma’ale Adumim in the occupied Palestinian West Bank. 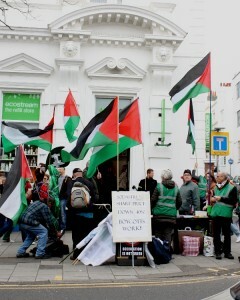 Responding to the Palestinians’ call for boycott, protesters have picketed the shop at least once a week since September 2012. You can find more information about this long-running campaign elsewhere on this site. The protest is part of an international campaign to boycott SodaStream. SodaStream’s CEO Daniel Birnbaum attributes the company’s decline to “headwinds” in the market. Amongst the gusts and squalls contributing to these “headwinds” are the winds of change, in the form of the rapidly-growing international boycott of the company, in recognition of its complicity in Israeli war crimes, ethnic cleansing and human rights abuses. It is only a matter of time before the company is forced to bow to the inevitable. With a deeply worrying bottom line, a so-called flagship store in Brighton haemorrhaging money, and a hostile public, SodaStream will soon need to dispose of its Brighton “asset”, which is only serving to draw attention to the plight of the Palestinian people at the hands of Israeli apartheid.